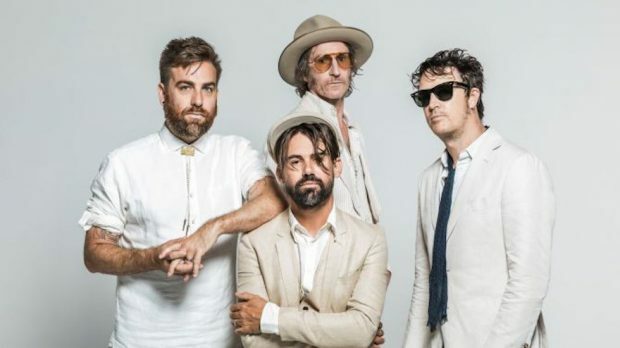 After sold-out tours in 2009 and 2014, Chris Cheney (The Living End), Phil Jamieson (Grinspoon), Tim Rogers (You Am I), and ARIA Award-winning solo artist Josh Pyke are reuniting for a 2018 tour in a nod to the 50th anniversary of The Beatles’ White Album. With such a diverse mix iconic Australian performers, you would think it would be a challenge making it all work onstage, but for The Living End frontman Chris Cheney, that’s actually the strength and the magic of coming together. BRAYDEN EDWARDS got the word on what he has learnt about The Beatles and his co-stars by being part of the project, the most fun and challenging riffs, and how it might have rubbed off on his own work with a new The Living End album out soon. This is a pretty amazing concept. Where did the idea come from and how did you come to be part of it? Well it first came about around 10 years ago on the 40th anniversary of the White Album when the promoter Tim Woods just had this idea basically to put a huge band together with a string section, horns, two drummers and keyboards and play the album back to back live and get four different singers to allocate up the songs and perform it. I’d never really done anything like this before and I was a bit hesitant at first with the idea of doing a covers thing or a tribute sat a bit weird with me. But when I spoke to the other three singers we all agreed that we wouldn’t approach it trying to sound like The Beatles. Instead we would bring our own sound to it. I guess we have because here we are 10 years down the track and it’s the third time we’ve done it and it’s been a huge success. We’ve given it something a little bit different and that’s what I’m most happy about in doing the show. Despite you all already coming from different bands they are also very different kinds of bands as well. Does that make it difficult to get everyone on the same page or is it actually a real strength in that you can each bring your own style and personality to the songs? Yeah I definitely think it’s part of the strength. And what’s really made it work was that that Lindsay Field who was one of the original backing singers had the job of allocating who was going to sing what. I think he did a really good job from the word go and we’re all really happy with our selection. I couldn’t sing Blackbird the way Josh does. He’s got such a beautiful voice and he’s such a great player and what he brings to it is just magic. It’s the same with Tim doing songs like Piggies and Happiness is a Warm Gun. He’s such a character and injects so much personality into it. For me doing Back in the USSR and Helter Skelter that’s more my background with the raw rock and roll kind of stuff. That’s part of what’s made it work. We’ve all been able to channel our own personalities and influences into what are already incredible songs. Obviously you don’t want to stuff it up or change it too much but you do want to give it a twist. And it must also be quite different for you typically playing with The Living End in a three-piece. How is it different for you being part of a big band for a change? Yes it’s very different, when everyone’s up there it’s like 21 people on stage. It’s insane! I’m only ever used to playing with a drummer and the bass guitar. It’s amazing for me to hear all the sounds when everyone is playing and the songs are just magnificent. And were you a huge fan of the songs and the album beforehand or did you come to get to know them more in the process of being part of this? I was already a fan but I’ve definitely discovered or rediscovered many parts of the record that I didn’t appreciate as much as I do now. And every moment I find I’m still discovering new things now, little nuances in the playing that for me just enhances my love for The Beatles and how clever they were and how ‘on’ they were. There might be a couple of dud songs throughout their career but there’s not many. It’s a pretty bloody good strike rate. What in particular have you discovered or learnt to appreciate more by being part of this? Yes for me there’s this song Josh sings called Cry Baby Cry and there’s this drum part in it that I’d never really heard or noticed before. There’s probably a lot of things in the mix of the White Album that don’t jump out in the way they do in the live show. Technology is better now and hearing it in a live setting and being able to see it happen too there are so many more things you pick up. On Happiness is a Warm Gun there’s such an odd and complex arrangement behind it all. Probably my favourite song of the lot is Julia that Josh sings as well and it’s just him with an acoustic guitar and it’s incredible and so sad. In the setting of the theatre it’s really quite emotional. As someone who certainly knows their way around a guitar are there any particular riffs that are your favourite to play or any that are quite challenging for you at all too? I love playing Helter Skelter because it’s such a great rocker. While My Guitar Gently Weeps is probably the big moment for me. That’s the mountain I have to climb every night and it’s such a powerful song that I find myself pacing around the floor a bit before I’m due to come out and play it. The Beatles just had a knack of playing the right parts and they’re a little bit odd here and there but beautifully placed. So on another note, The Living End have got a new album and tour on the way. What can we expect from your new material, a bit more of a Beatles influence on it perhaps? (laughs) Well you know what there is on a couple of tracks. There are a couple that are quite poppy and we’ve always kind of had that in our songs. There’s a bit of the Beatles influence there and maybe some ELO as well. I’m super pumped to get out and play them. After the White Album shows are done I think I’ve got two days off and then we’re off to Europe for a tour and it’s really exciting actually. I hate it when bands say this but it probably is the best record we’ve done in a long time. It’s got a lot of character to it and a lot of space, recording it in Berlin just added a whole new element to it and it’s turned out much better than we had even hoped so we’re super proud.